I'm certainly no baker but muffins usually always seem to turn out okay and so if I can make them, anyone can. 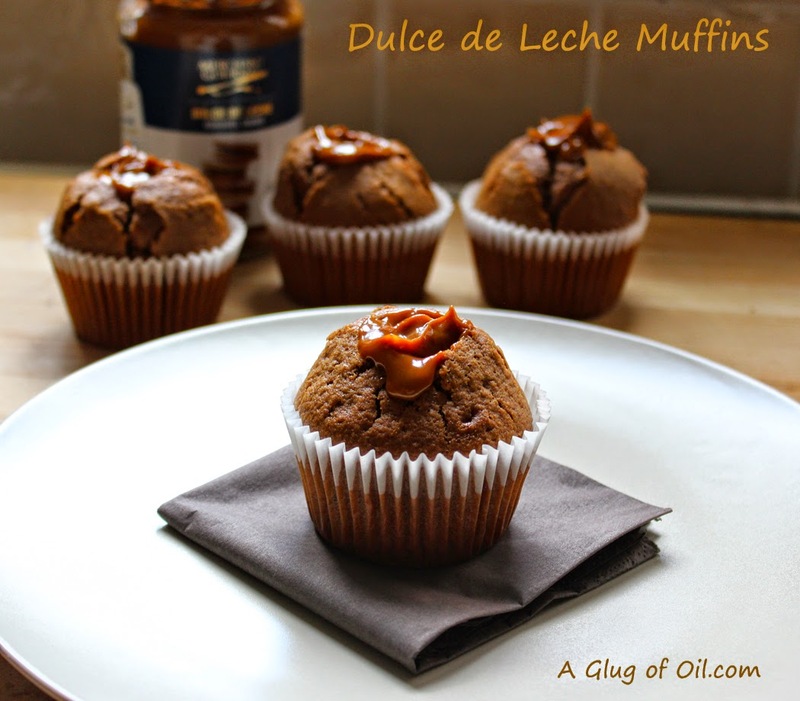 Of course the ever popular Chocolate Chip Muffin is always a good thing, but filled with Dulce de Leche the humble muffin becomes something amazing. That said, I don't particularly like cakes of any sort, but Paul does! Pop the muffin cases into a muffin tray. Weigh out the dry ingredients into a large bowl. Pour all the liquid ingredients into a measuring jug. Mix both together with a wooden spoon until you have a runny lump free batter. Now spoon into the muffin cases. Pop into a preheated oven to cook for 20 minutes or until the muffins are risen and springy - check after 18 minutes. It's best to put this filling in while the muffins are still hot since it then melts and gets right into the middle of the muffin. Using a long thin sharp knife - carefully make a hole in each - do one at a time and fill with Dulce de leche - pushing it into the hole. Pop each muffin after filling it onto a wire rack and leave to cool.....Or be cheeky and eat one while it's still hot! I've used Dulce de Leche in a couple of things recently; check out my Carameltia Ice Cream Sundae and Banana and Chocolate Dessert Pizza. I adore dulche de leche! These look so tempting! My goodness, they look so indulgent and gorgeous. I must say that pic is perfect too! These look delicious! Do you think I could try them using a gluten-free flour?